Marlys Smith, 78, of Fort Dodge, died Wednesday, August 22, 2018, at her home. Services will be 10:30 AM Tuesday, August 28, 2018, at St. Olaf Lutheran Church in Fort Dodge. Burial will be in Memorial Park Cemetery. Visitation will be from 5:00 p.m. to 8:00 p.m. on Monday at the Gunderson Funeral Home and Cremation Services in Fort Dodge. Marlys is survived by her three daughter, Kelli Henricks, Stacy (Troy) Hendrickson, and Melissa (Mark) Wilson all of Fort Dodge; 11 grandchildren and 20 great grandchildren. 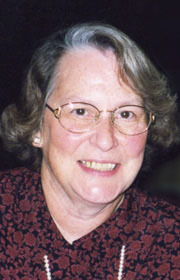 She was preceded in death by her husband, William “Bill” Smith in 2004; their two sons, William H. Smith in 1959 and William A. Smith in 1988; her parents; and her 8 siblings, Harold, Duane, Clarine, Dorothy, Carol, Phyllis, Charles, and Richard. Marlys Lydia Rossow, the daughter of Hugo Christian and Viola (Otillia) Rossow, was born December 10, 1939, in Vincent, Iowa. She was named after her father’s sisters. Marlys lived on the farm until she was 12. On March 8, 1958, she was united in marriage to William Gerhard Smith. To this union was born five children. Marlys was a stay at home mom and good at it! Though the years she helped her husband at Smithway Motor Xpress on and off. In 2007, Marlys sold the trucking company. Marlys loved living on the farm, raising her kids and grandchildren. She loved bowling with friends and being a member of P.E.O. Marlys was a member of St. Olaf Lutheran Church, serving on the church foundation board, altar guild and was involved with the Wednesday night girls.